Generally dental emergencies are rarely life threatening but can cause inconvenience to the person involved. The following are advice to people when faced with these emergencies. A picture showing broken upper front tooth following a fall. Causes of broken or chipped tooth. The common causes of broken or chipped tooth are trauma (eg. fall, accident, contact sports and assault), tooth decay and abuse (eg. use the back teeth as bottle opener). The tooth could break at the crown or root depending on the amount and direction of force involved and the age of the person. The crown and root of primary teeth (milk teeth) are broken / chipped less frequently because the alveolar bone is more elastic in children. A simple self examination is required. Using a mirror check the surrounding soft tissue (such as lips, gum and tongue) for injuries. There will be profuse bleeding if soft tissue injury is present. Do not panic, a simple measure usually stops the bleeding, example; pressing on the wound with fingers or biting on a clean handkerchief for 15 – 20 minutes. Hold the tooth with your fingers and feel for movement when you move it. Check the position of the tooth in the arch for displacement. It may be displaced inward or outward or pushed into the bone (the tooth appeared shorter than the adjacent teeth). 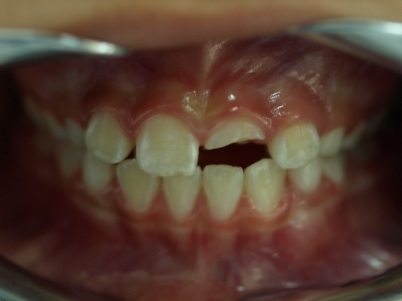 Assess the risk of injury to the underlying developing permanent tooth in children. Assess the mobility and displacement of the tooth. Recommending treatment based on the extent of tooth injury and whether the tooth is mobile or displaced. The use of a mouth guard is recommended in contact sports. This will prevent and/or minimize injury to the front teeth. The tooth that has been knocked out of its socket is known as an avulsed tooth. The common causes of an avulsed tooth are trauma: fall, accident, contact sports and assault. What to do with the tooth? Look for the tooth if possible. It is alright if you cannot find it. If the tooth is dirty, hold it by the crown and wash under running water. Do not touch the root surface or wash it with antiseptic solution. Place the tooth into the socket as soon as possible. If the tooth is replanted within 1 hour, the chances of saving the tooth is good. Do not force the tooth into the socket. If immediate replanting is not possible, place the tooth in the person’s mouth after the bleeding from the socket stops. If this is not possible, place the tooth in a cup containing milk (or in water with a pinch of salt if no milk is available). See your dentist as soon as possible. The tooth should be replanted within 1 hour from the time it was knocked out to have a better prognosis. Remember, the longer the tooth is outside the socket, the less favourable is the prognosis of the tooth. What to do with the socket? Bite on a clean handkerchief or gauze for 15 – 20 minutes in order to stop the bleeding. Note: If the avulsed tooth is a milk (primary) tooth, do not replant it. Go to the nearest accident and emergency unit (at the Hospital) or call up your dentist for an urgent appointment. The use of mouth guard is recommended in contact sports. Toothache can be very painful. Over the counter pain killer eg paracetamol, may not be sufficient to relieve the pain. A stronger pain killer may be needed to relieve the pain. Do not take more than the recommended dose of pain killer. Seek an urgent appointment with your dentist. The pain may get worse if an abscess develops. You may have swelling on your gum or face if an abscess occurs. If this happens, seek treatment at the nearest accident and emergency unit as soon as possible. What happened when a toothache left untreated? If the toothache is left untreated it may leads to acute localized gum abscess (acute dento-alveolar abscess) which subsequently leads to facial cellulitis or abscess. The pain will get worse when an abscess develops. You may have swelling on your gum or face if an abscess occurs. If this happens, seek treatment at the nearest Accident and Emergency Unit as soon as possible. Gum abscess is localized swelling of the gum associated with badly decayed tooth or heavily restored tooth (dento-alveolar abscess) or severe gum disease (periodontal abscess) or infection of gum covering erupting tooth (pericoronitis). Usually patient has dull pain, swollen gum and sometimes discharge seen. What to do when you have gum abscess? Call your dentist for an urgent appointment. Your dentist will be able to identify the cause of gum swelling and institute the required treatment. If left untreated it may leads to facial abscess or cellulitis. What is facial abscess and cellulitis? Facial abscess is a localized infection on the face, jaw and neck and cellulitis is a spreading infection over a wide area on the face, jaw and neck. Usually patient has fever, localized or diffused swelling with redness over it. The swelling can be severe if there is an underlying medical problem eg. uncontrolled diabetes. 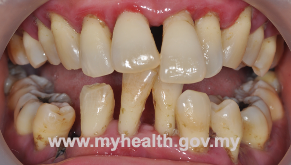 Untreated acute toothache or localized gum abscess (dento-alveolar and periodontal abcess). Exacerbation of chronic dental problem such as gum abscess. What to do if you have facial abscess or cellulitis? Seek an urgent treatment at the nearest Accident and Emergency Unit as soon as possible. If underlying medical problem is present eg. uncontrolled diabetes, admission to hospital is required to stabilized the medical condition and control of infection. What to do when your denture is broken? Wash your denture with denture cleaning solution. 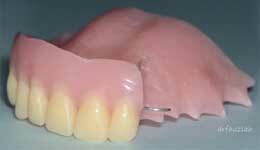 Avoid using the denture because the sharp edges of the denture may hurt the gum, cheek and tongue. Place the denture in a clean container containing water to prevent shrinkage. See your dentist as soon as possible. Your dentist may recommend repairing your denture or make a new denture. The most common causes of crowns / bridges becoming loose are: cementation failure, broken framework or problems with the abutment teeth (teeth supporting the bridge). The abutment teeth could be decayed or fractured. What to do when your crowns/bridges become loose? If your crown/bridge is still attached, try to remove the crown/bridge using your fingers. If it is still firm, leave it in place. Do not use that side of the mouth when eating. Make an early appointment with your dentist. Remember to bring along your crowns/bridges that had came off with you when you see your dentist. Avoid biting on hard food when you have a crown or bridge. You may need to slice them into smaller pieces before chewing them. Meticulous oral hygiene is recommended to prevent decay of the abutment teeth. Regular checkup on the integrity of your crowns/bridges framework is advisable. What to do when you lose your filling? Seek an early appointment with your dentist. What to do if your orthodontic bracket is lost? Call your dentist or orthodontist for an urgent appointment. If you wait for your routine appointment, your teeth may relapse (go back to their old position), thus prolonging your treatment. If possible avoid eating hard food. You may need to slice them into smaller pieces before chewing them. Be careful when you do your routine oral hygiene (brushing and flossing). Causes of bitten lip/ tongue. The common causes of bitten lip or tongue are trauma and epileptic fits. There may be a lot of bleeding. Do not panic, a simple measure usually stops the bleeding: pressing the wound with fingers or biting on clean handkerchief or gauze for 15 – 20 minutes. Let the person lie on to the side, to prevent him/her from choking. Send the person to the nearest accident and emergency unit as soon as possible.